Volunteers of the Tzu Chi Foundation in Ecuador organized a five-day Cash-for-Relief program in a third city, to enable its residents to clean up their community after the devastating earthquake on April 16. On May 16, the team of volunteers arrived at San Vicente Canoa, one of the worst hit areas, and started the program the next day. Earlier, they had held similar programs for eight days in the cities of Manta and Portoviejo. San Vicente Canoa is a small tourist city on the Pacific coast, famed for its beautiful coastline. But the city fell silent after the earthquake, until the arrival of the volunteers. Over five days, they brought together the will and energy of everyone and by the end had restored the small city to its previous beauty. “Before, in Ecuador, cleaning brushes were held by women,” said a language teacher in San Vicente Canoa who took part in the program. “This time, many men also used the brushes to take part in the cleaning work. 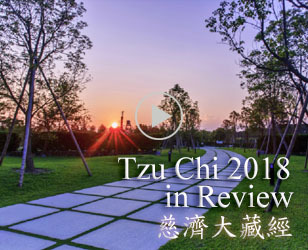 It cannot be measured by money.” He felt that it was Tzu Chi who brought together the people of the city; everyone took up a brush and cleaned the city together — this made them united and work in harmony. 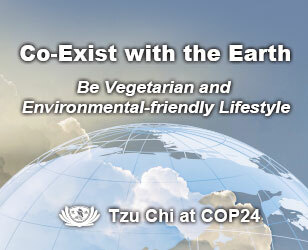 On April 21, the third group of Tzu Chi volunteers arrived and joined those of the second group. At seven o’clock in the morning, a very large number of people had gathered in the square in front of the city government park. Without being given instructions, they divided themselves up into groups of 10; they formed an arch round the trees in the garden. White is a symbol of hope. At the gathering, the citizens of Canoa sang the song of hope; everyone was feeling very excited. The volunteers performed the “One Family” in sign language, to interact with the residents. Among the participants was a group of 16 people from Manta organized by a member of the city government; they gave up their holiday to help. The Mayor of San Vicente Rossana Cevallos said: “today is the day of the thorough cleaning. The city government will provide paint so that the residents can paint the sides of the streets and turn them into shining white, a symbol of hope, and bring self-confidence and self-respect.” Because of the hope brought by Tzu Chi, everyone worked hard to paint the sidewalks; on the road, they wrote in white paint “CANOA VIVE GRACIAS TZU CHI” to thank Tzu Chi’s efforts. Sister Mercedes, a nun in Canoa, encouraged all the residents to work together and make their community more beautiful. They used large letters to express their gratitude and encourage the city to go forward. Some even made bamboo banks which they handed round at the large meeting, inviting people to make a contribution. 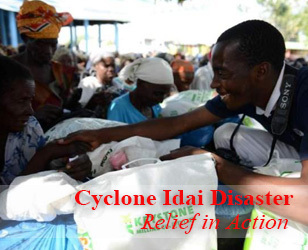 Even some who had just received the relief fund from the program contribute in money to help others. In the morning, after the end of the gathering, the volunteers immediately went up the Pacific coast to Pedernales, another small seaside city badly hit by the earthquake. That evening officials from the city government’s development office held a meeting with the third group of volunteers to discuss how to organize a Cash-for-Relief program in the city. Tzu Chi volunteers bring love and care to the stricken areas, and hope to help then rebuild their beautiful communities.